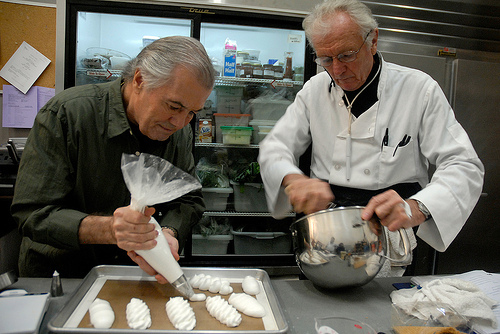 Jacques Pepin and Jean-Claude Szurdak make pastries in the back kitchen at KQED during the taping of Essential Pepin. Jacques Pépin recently filmed his new cooking series Essential Pépin at KQED, which will premiere in fall 2011 on PBS stations nationwide. It breaks new ground from previous series due to its thematic nature, with whole shows based on subjects such as poultry, shellfish, soup, and fruit desserts and easy recipes that are practical for the home chef. This seasoned icon of culinary television shot 26 episodes in three weeks at a pace of two to three episodes per day; Connecticut, where Pépin calls home, was simply loaning him to us for that time. Backstage, the kitchen staff, which included Culinary Producers Christine Swett and David Shalleck as well as Pépin's longtime friend and right-hand man Jean-Claude Szurdak, would arrive at 7:30 a.m. to begin preparing ingredients for Pépin to cook on set as well as duplicates of the dishes (or "twins"). Pépin himself was already well into kitchen preparations when we arrived on one of those final mornings at 9:30 a.m. We didn't expect him to take such a hands-on role in the production kitchen, but there he was, showing young chefs and interns his quick tips on how to break down a chicken and open and clean shellfish. He was relaxed and happy to answer their questions, offering a valuable mentorship. A behind-the-scenes slideshow of the taping of Jacques Pépin's new series Essential Pépin. There was a brief moment to speak with Pépin after he finished prepping in the production kitchen and before he started filming his shellfish episode. We wondered what this pioneer of culinary television, who won an Emmy in 2001 for his work with Julia Child, thinks of the generation of food celebrities on television. "Frankly I don't really do much [food TV watching]," he admitted. "I'm kind of addicted to news so it's more MSNBC, CNN, or something like this for me. But if you have an open mind you can always learn something from anyone you cook with -- sometimes you learn what not to do as well as what to do but you do learn something." "Everyone looks at food in a different way, and when I go to the Food & Wine festival in Aspen, for example, there is 5000 food people there and then you have Lidia Bastianich, Mario Batali, Emeril Lagasse, everyone is there. And certainly I will have people who come up to me and say, 'Out of all the food shows on television, you are the best.' And the reason they say this is that the people who don't like me don’t come and talk to me. Only the people who like me come and talk to me. You'll have another group who will come up to, I don’t know, Bobby Flay and say, 'Hey, I look at all the shows on television, you're the best,' and so forth. And that's the way it should be." "I like to have fun on television and for people to have fun and have a good time looking at it," he added, "but ultimately I try to teach something." At last, it was almost show time. The Essential Pépin set blended a dream kitchen with peeks of an office study and a verdant backyard on either side. It looked amazingly natural, as if it was transplanted straight from his Connecticut home. The lenses of five large cameras were trained overhead and all around the stove area. Dissecting the multiple angles splashed across a bank of screens in the control room, director Bruce Franchini and series producer Tina Salter patiently tweezed out inconsistencies that would disrupt the show's continuity, whether accidentally substituting chives for scallions or taking a dish out of the wrong oven. But while it was meticulous, it wasn't as serious as surgery in there; overheard, the opening strains of the theme from Rawhide ("rollin', rollin', rollin'!") sung by a crew member nearly each time the cameras and audio would start recording. "Ooh, that's great," exclaimed Franchini, as Pépin dropped his crab cakes in hot oil in the next room. "We love sizzle, we love steam!" The preparation of each dish took about 45 minutes to film. It was impressive to see almost no time wasted in the process. Both Pépin and his daughter, Claudine remained cool throughout the three hours it took to complete the first episode of the day; summoning up the poise to appear fresh even at times when they needed to repeat either a short step in the cooking process or a sentence or, in Claudine's case, when she needed to eat two oysters in quick succession. The same graceful professionalism was to be said of Claudine's adorable young daughter Shorey, who joined her mother and grandfather to adventurously taste some of the dishes on camera. Being inside the studio as the episode unfolded was an exciting sensory experience for everything except our poor taste buds, which didn’t get to be indulged in the same way that our eyes, ears, and nose did. As Pépin dropped the beginnings of clam fritters into hot oil, the sizzle was amplified to an almost concert-like level. When he lifted the lid on the pot of mussels, which had been boiling in garlic-spiked broth, and poured in a measure of wine, the intoxicating scent seemed equally boosted, though we know there’s no such thing as smell-o-vision in real life. After the cameras took their close-up "beauty shots" of each completed dish, they were whisked away to a back copy room that had been temporarily converted into a guerilla-style photography studio. Bay Area Bites Producer Wendy Goodfriend carefully shot pictures as Cara Miller helped David Shalleck style the plate with the use of tweezers and a delicate paintbrush dipped in water. The images will appear on the Essential Pépin website, which will feature all the full episodes online along with three printable recipes for each show. The website's launch will coincide with the program's premiere in fall 2011. Essential Pépin the book will contain 750 recipes and 200 of Pépin's own illustrations as well as a three-plus hour DVD that Pépin says will amount to a wonderful "apprenticeship" for any home cook. The television series uses approximately 150 of these recipes. In all of these concurrent projects, his techniques can be used to cook from any book or straight from the heart. Follow Pépin on Facebook and Twitter for more news and timely updates. Visit Jacques' official website at KQED Food. And for a fascinating timeline of the life of this culinary icon, be sure to read his autobiography and visit the archives of KQED's TV program Jacques Pépin: The Apprentice — Then & Now.